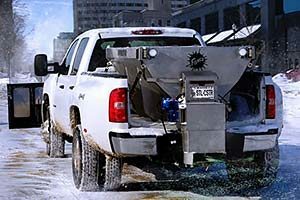 The POLY-CASTER spreader line combines a low-maintenance rust-proof double-wall poly hopper with a smooth, quiet electric-drive system for the ultimate in de-icing performance. It effectively spreads all ice control materials including salt, sand, a salt/sand mix or even wet sand. And the POLY-CASTER spreader comes loaded with more standard features to enhance operator efficiency and convenience. Available in three sizes (1.5 cu. yd., 1.8 cu. yd., 2.5 cu. yd. 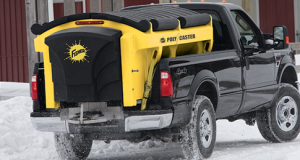 ), there’s a POLY-CASTER spreader ready to meet your snow and ice removal needs. Now offering FLEET FLEX technology for easy interchange between electric hopper spreaders, the POLY-CASTER hopper spreader provides enhanced controls and a convenient accessory hub for improved business profitability and years of reliable low-maintenance performance. When it comes to engineering excellence, small details can make a big difference in the efficiency and profitability of your de-icing activity. The low-maintenance, rust-resistant STEEL-CASTER™ stainless steel hopper spreader was designed to maximize material control and minimize waste. With dual electric motors and enhanced variable-speed control the STEEL-CASTER hopper spreader is available in six sizes for pickup, dump body and flatbed trucks. Spreaders from 100 lb. up to 16 yd. capacity. 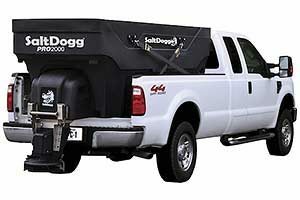 From manual walk-behind spreaders, to electric drive, gas powered or hydraulic drive spreaders, SaltDogg has what you need.